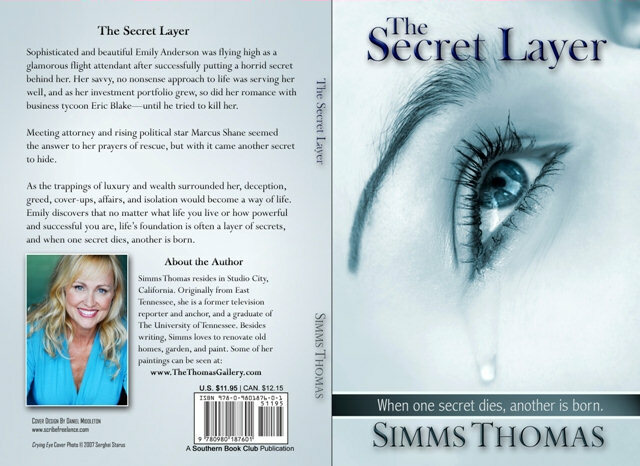 Simms Thomas' book, The Secret Layer, is now available. And for a limited time Simms will sign your book and dedicate it to the person of your choosing. Just submit the person's name during the purchase process. Shipping is 1-3 days by USPS Priority mail for $4.80. To purchase with check or money order: Mail your order to Box 53112, Knoxville, TN 37923. Check or money order made out to Simms Thomas INC. Total:$14.80 ($10.00 plus $4.80 priority shipping) Allow 4-6 weeks for shipping. Please include your address and the person's name to whom you would like the autograph made out. THE SUN WAS CRESTING OVER the mountains of East Tennessee, and the vista it provided took Emily’s breath away. Looking down on the vivid display of colors provided by the changing maple, oak, and elm trees, it looked too brilliant to be real. An artist would have a hard time capturing the true beauty that lay beneath her. Seattle was beautiful, with its fall foliage and the cold wintry nights, but this was nature bursting against a sky so blue and utterly amazing that it was almost too much to view. She closed her eyes, wanting to remember, to burn this image in her mind forever. Emily tried to count the different hues of oranges and yellows, and the pale soft browns compared to the mahogany browns and the rich, earthy deep browns. The mingling of colors created a palette of colors only God could have created. She loved autumn. She had forgotten that autumn in Tennessee was a truly awe inspiring experience. Stepping off the plane, a gust of crisp fresh air sent a chill up Emily’s spine. “Stay steady. You’re here now,” she repeated to herself. EMILY FOUND HER FATHER’S ROOM on the fifth floor of Baptist Hospital in south Knoxville. His body looked so small and frail, outlined against the oversized hospital window overlooking the Tennessee River below. Knoxville was beautiful at this time of year. The river snaked through the edge of the city and created a fringe or border for the southern portion of the downtown area. The changing trees transformed thebusiness district, causing it to resemble a romantic hideaway snuggled against the backdrop of the Great Smoky Mountains. Usually, the city was a dull gray outlined with older red brick buildings and decaying concrete. A typical southern city a little past its prime. It especially looked harsh against a bleak, dreary winter sky that settled over the city for so many months each year. But Knoxville was at its prettiest during the fall months. Except maybe in the spring, when the azaleas, hundreds of dogwoods, tulips, and daffodils took over, Emily mused. Knoxville in the springtime was lovely, too. While Emily debated the changes in seasons and the scenic possibilities that were to be seen in this East Tennessee city, her father awakened. “Hey, Daddy, I’m here. It’s me, Em.” A weak smile pressed against his lips. His eyes weren’t their vivid blue but a watery, paler version. The mischief in them was gone. But the love was there. He was sick. He was dying and Emily knew it. She closed her own eyes and gently rubbed his cold, paper thin hands and held them tightly. “Thank you dear God for letting me get here. Just to let me hold his hand and look into his precious eyes one more time.” The hospital room was eerily quiet. An occasional beep, the call for a doctor or nurse, could be heard from speakers in the hallway. Her father’s breathing echoed through the room as it became slightly more labored. Emily continued to hold his hand. She stroked his face and his eyebrows, just as she did her own children’s. She wondered if he had done this to her as a child. Marjorie arrived just before seven that night. She hugged Emily tenderly and held her for a long moment. The two shared a world of understanding as they stood before her father’s bed. “Emily?” Her father’s weak voice broke their silence. “Yes, Daddy? I am right here.” “How’s that sweet Caroline and Steven James?” “Growing so big. Just wait until you see them. Now, you rest, because you have to get better so you can come to my house for Christmas.” She choked on her own words. “Yes, that would be nice. Christmas with Emily and the children. I love you, Emily.” “I love you, too Daddy.” Emily hung her head and cried softly as her father’s breath slowly but surely became slower and more difficult for him. She held his hand, trying with all of her might to keep life in his failing body. She gently let her thumb rub each finger and would turn his hand over in hers, trying to keep it warm. But her attempts were to no avail. Emily’s father died shortly after midnight on her children’s first birthday. SEVIERVILLE, TENNESSEE HAD, by some people’s standards, grown by leaps and bounds. It now had close to twenty hotels, a few of them major chains, but they were still small. Emily stayed in a newer hotel. She pulled the thick orange and green paisley print curtain aside as she waited and watched for her father’s sister, Eunice, to pick her up for the receiving of friends at the funeral home. This is what she had dreaded. This is the night of nights she knew would come at some point in her life. The time was now when she would have to face her uncles. It wasn’t that she hadn’t seen them since that terrible night so many years ago. But it was the first time she would face them as an adult who wanted to hold them accountable for destroying a little girl’s dreams and life. Of course, she had never thought it would be at the funeral home with friends and family passing through, mourning the death of one of her parents. But she knew it would come. What would she say to them? How would she react to them? Should she ignore them? Should she march up to them and kick them and spit in their faces and go through her speech, which she had rehearsed so many times in her life? Now that the time had come, she didn’t know how or what to do. She felt sick to her stomach. The telephone rang, causing her to jump as a small cry escaped from her lips. Upon hearing her mother’s tired and exhausted voice, Emily felt stronger. “Em, I just wanted to tell you not to worry about anything tonight. I mean, nobody is gonna be there tonight to cause you any problem,” Marjorie managed to get out. Emily could tell that her mother didn’t know how or what to say. Even though her voiced was ravaged with sorrow it was also drained with defeat, loneliness, and guilt. Emily’s heart ached for mother. She wanted to simply say it was okay and that she understood, but she let her continue. “You got enough on ya and I just never did discuss it with you and, well, I figured a lot out, Emily. I ain’t seen hide nor hair of Roy or Delbert in over a year. Since I read your note. Emily, I am sorry. If your Daddy had known, he would’ve killed them.” Emily just held the telephone close to her ear and realized her hands were trembling. The headlights of her aunt’s car swinging into the parking space in front of her window brought Emily out of her trance. “New beginnings, Mom. Aunt Eunice is here. I’ll see you at the funeral home.” And that had been it. Emily slowly put the telephone back in its cradle and swallowed hard as a single tear made its way down her cheek. All those years of anguish, hate, and pain. The pure pent up rage of a lifetime just talked about in so few words. New beginnings, Emily thought. “Oh, Daddy, I miss you so much already.” A LIGHT FROST COATED THE GROUND and the morning light danced across the grass because of the moisture. It was colder than normal, but it was a glorious day, Emily thought. Blue skies. Crisp fresh air. Smoldering Smokey Mountains with the blue-gray mist hanging over the ridges and stillness. “This is the day my Daddy will be buried,” Emily said softy. Emily was still in shock and was physically exhausted by the past few days. Isolating herself in her hotel room, not wanting to spend too much time at her parent’s house had been a wise choice. She had stayed the first day at the hospital until her Father had died, and then she went straight to the hotel. Marjorie had never once questioned her decision. Walter Lee Anderson was to be laid to rest shortly before noon at Hillvale Memorial Park. Emily glanced out the window of the small hotel room and thought of her children. She missed them, but was thankful she had come. It had been life changing for Emily. She knew deep in her heart that she would never have forgiven herself had she not come to him. She almost felt lucky. The cancer had slowly taken her father’s life over the past three years, Emily had learned. But in the end he had won his own battle against it because he had waited on her to get there before he succumbed to it. He knew she would come to him. And come she had. Her Daddy. “Yes, he would have killed them if he had known,” she whispered. “MOTHER, I WANT YOU TO COME FOR A visit in the early spring. It’ll do us both good,” Emily said as she hugged her mother goodbye. She was ready to get back to her life in Seattle and to her children. It was unbelievable how much she missed Caroline and Steven James. “I’m glad you stopped by before you left. I didn’t know if you would. I would have understood. I’ll get out there, I promise. The taxi cab’s motor idled loudly in the driveway. Emily put her arms around her mother one last time and squeezed hard. “I love you, mother. Goodbye.” Emily settled into the dingy backseat, letting her head rest against the faded forest green vinyl faux leather. She studied Wayne Dickens’s taxi cab driver’s permit posted next to the meter lever. Wayne puffed on his Marlboro, letting the thick blue smoke curl from his nose and mouth. With every other intake he would blow smoke rings, this while he slowly pulled away from the street where Emily had grown up. He then got onto the main highway that leads through Sevierville. She watched as the tiny town nestled in the hills rolled by. Up ahead, a small traffic jam was causing a backup on the main road. With only four lights on the road, traffic jams were a little unusual. “Looks like we got somebody hurt up here,” Wayne announced officially. He slowed the car, rolling his window down to peer out, not to help or offer assistance, but just to get a better look at the situation. Emily, too, leaned forward to study the commotion. There in the road lay a man, bleeding. His battered and bloody body lay lifeless on the cold pavement. Another man, who was shaking with stooped shoulders, andwas apparently racked with sorrow, bent over him. It was in that instant that Emily recognized him. Roy slowly turned his head around, almost as if he sensed her presence. He immediately caught Emily’s eye. He returned her stare through thick bloodshot eyes. His stance was shaky and feeble. Emily realized it wasn’t so much the tragedy before him making him woozy as the fact that he was drunk. She also realized that the man he hovered over was Delbert, and he was dead. “Man, looks like he just got himself killed by that pickup truck. Must have walked right out in front of him. Cracked that guy’s windshield...” Emily didn’t hear the rest of Wayne’s description of the accident scene. “Just get me to the airport, please,” Emily said firmly. She didn’t look back. She didn’t feel sorrow. She didn’t feel pain. She felt nothing at all.